Október 21-én az Európának szánt angol nyelvû kínai újságban, a China Dailyben a lábtoll-labdázásról írt Zhang Xi. Írásában három európai, a német Peter von Rüden, a görög Jordan Stavridis és a magyar Fehér János rövid véleményére is kíváncsi volt. After years of sedentary office work, Wang Guiqin, 56, is starting to feel spry once more. Upon retirement, the Beijing native joined a group of similarly aged folks for a daily dose of a traditional Asian game where participants use only their feet and body (hands are not permitted) to keep a shuttlecock, which is called a jianzi in Mandarin, lofted in the air. Each day, Wang and her friends gather in a small garden to balance and kick the weighted, feathered jianzi. Some play by themselves, while others kick the shuttle back and forth to each other. "I didn't exercise much because I had been working in an office for a long time. After my retirement last year, I had hoped to find a suitable way to stay in shape, so I began to play jianzi, which is not that strenuous for me," Wang says. Wang says she has not only gotten stronger physically, she has also made some new friends because of the game, much as she did when she was young. "Actually, when I was young, almost all girls knew how to play the game. Nowadays, I play for health," she says. But it's not only the elderly who are playing the game in the streets and courtyards of China. Shuttlecock competitions are slowly cropping up all over China, with officiated matches between teams of three players leaping, kicking and spiking the jianzi growing in popularity. The game apparently emerged during the Western Han Dynasty (206 BC-AD 24), more than 2,000 years ago. The game is believed to have evolved from cuju, a game that has similarities to soccer and was used in military training. Aside from the exercise of keeping the jianzi in the air, as Wang does daily, there are two other ways of playing jianzi, both of which are competitive. One is the shuttlecock competition, which is similar to badminton in that a net is used between two teams on a small court. The feathery jianzi, which buoys elegantly in the air when kicked high, also lends itself to a sort of artistic performance, where a single kicker uses a series of complicated movements to keep the shuttle aloft. This artistic style of competition is scored similarly to gymnastics. The first-ever national competition in China for the artistic style of jianzi kicking was held in 1933, 16 years before the founding of the People's Republic of China. It was not until the 1980s that people adapted the game to shuttlecock competitions. In 1987, China established the Chinese Shuttlecock Association and in 1999, the International Shuttlecock Federation (ISF) was created at a time when other countries around the world were beginning to recognize the sport. Currently 21 nations and regions in the world recognize the ISF. 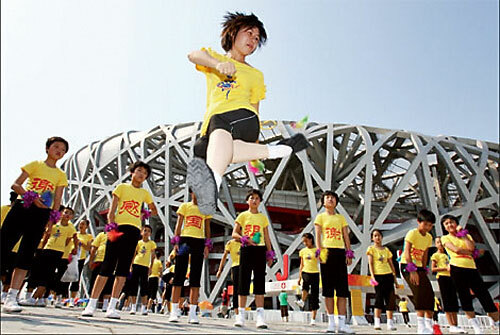 Last year, China hosted the 6th ISF World Shuttlecock Championships, the third time the nation has played host to the games. Athletes from 14 countries and regions participated, with China and Vietnam dominating most of the events. The next competition will be held in Vietnam in 2013. China also has its own national competition. Different cities in this country have hosted the annual National Shuttlecock Championship for over 20 years through the scant support of local governments and shuttlecock manufacturers. This year's game is being held this month in Jiangsu province and there are approximately 450 participants, 100 more than last year. There is also the China Shuttlecock Open, which made its debut last year in the capital and attracted 35 teams of nearly 200 players, all of whom came from corporations, universities and social organizations. This year's China Shuttlecock Open, slated for the end of this month, will again be held in Beijing and will include men, women and mixed divisions. Jianzi is also growing in popularity in other countries such as Germany, Hungary and Greece. Hungary, for example, was one of the first countries aside from China to organize its own shuttlecock federation back in 1995. Feher Janos, secretary general of the Hungarian Shuttlecock Association and vice-president of the International Shuttlecock Federation, says shuttlecock championships in Hungary have been organized since 1996. He explained that the sport could develop even further if the ISF was a member of the General Association of International Sport Federations and International World Games Association, both of which are international bodies of smaller sports associations. Peter von Ruden, founder of the German Shuttlecock Federation and one of the vice-presidents at the ISF, says Germany is also organizing tournaments and leagues but said the sport could develop faster if games were televised. In Greece, the sport is blossoming. Jordan Stavridis, president of the Greek Shuttlecock Federation (GSF), says the organization has 20 athletic clubs and hundreds of athletes. "We had the 1st Pan-Hellenic Shuttlecock Championships in 2003 and we are trying to play as much as we can," Stavridis says. "GSF has begun the process of getting the sport to be officially recognized by our sports ministry. We are pretty sure that the sport will be very popular not only in my country but also around the world." One major obstacle for the sport, at least in China, is the lack of financial support and recognition from the central government and sponsors, say several Chinese jianzi organizers. "In the past, only local governments financially supported the game," says Wei Yong, secretary-general for both the ISF and the Chinese Shuttlecock Association. Shi Yanfang at the Beijing Shuttlecock & Rope Sports Association agrees, saying: "We still lack money since many businessmen do not think it is worth to support this game. Although TV stations broadcast our competitions, not many people know about this activity. We still have to raise money by ourselves." But as the game of shuttlecock becomes popular throughout China and in Europe, the development of the artistic style of kicking jianzi is slower. Shi says that is because the artistic practice is much more difficult than the badmintonlike games. "Although the artistic practice of jianzi has a longer history than shuttlecock competitions, you need a lot of training to master the artistic kicking methods, which has restricted its development," Shi says. There are about 100 different movements in the artistic practice of kicking jianzi. The only national competition in China for the artistic style of jianzi was held in 2006, Shi says, though a second tournament could be held next year. Deng Dan, a former champion in artistic jianzi kicking, also hopes the activity will develop in different regions in China. "This activity is not that popular in China, especially in the southern and western regions," says Deng, who adds that young people know little about the sport in cities such as Chongqing in southwestern China. "Here, elderly people prefer this sport," she says.